Michel Warchawski standing in Canada Park near Jerusalem. Photo by Jillian Kestler-D’Amours. Sitting cross-legged in a circle, a group of about 20 Israeli school children are chatting excitedly under the shade of tall pine trees one sunny afternoon in March. A few meters away, the names of hundreds of Canadians are prominently displayed on row upon row of beige, ceramic plaques. Montreal. Toronto. Winnipeg. Vancouver. Welcome to Canada Park. The Jewish National Fund of Canada built this vast and sprawling national park, just 30 minutes’ drive from Jerusalem, in the early 1970s. The idyllic setting of the park today, however, belies its bitter origins. Three Palestinian villages—Imwas, Yalu and Beit Nuba—once stood on this land, now covered in pine trees and narrow, winding hiking trails. But that history has been largely scrubbed from the landscape and Israeli and Canadian memory. “It’s either ancient times or Israel. 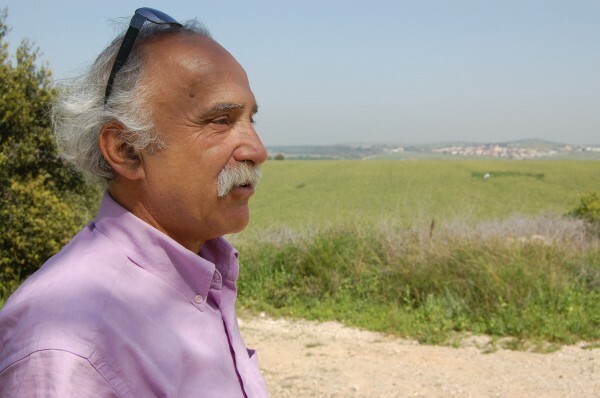 There’s nothing in between,” Israeli activist Michel Warschawski tells me, as he stops the car to read a sign in Hebrew marking the site of a Byzantine-era wine press inside the park. Warschawski was 17 when he witnessed the forced exodus of Palestinians from the three Palestinian villages in June of 1967, during the Six Days War. Palestinian men, women and children marched quietly up the hillside just past the Jewish kibbutz of Sha’alvim where he lived. Standing inside Canada Park at the edge of a lush, green field, Warschawski pointed towards the red roofs of Sha’alvim in the distance, just beyond what once was the “no man’s land” between Israeli and Jordanian controlled areas from 1948 and 1967. We continued along the rocky path in silence, him lost in thought and I busying myself with examining the shrubs, trees and overgrown grass under my feet for anything that would hint at the deep Palestinian roots of the area. Today, more than 40 years after Imwas, Yalu and Beit Nuba were demolished, a few olive trees, cactuses, and the crumbling stone foundations of old homes are the only indicators of the area’s Palestinian inhabitants. Ahmad Abu Ghosh was 14 when Israeli soldiers forced him and his family out of their village of Imwas. The villagers weren’t allowed to take any belongings with them, and were told by the Israeli army to march eastward in the direction of what is now known as the West Bank. “We walked about 32 kilometers that day from 5 o’clock until 5 o’clock p.m. Then we reached Ramallah,” he said. Without a permit to enter Israel, the last time Abu Ghosh visited his family’s former village was 1991. I had our conversation in mind as I surveyed the broken stones and collapsed former Palestinian homes, which, despite years of erosion and wear, remain the only witnesses to a planned and systematic expulsion of Palestinians from the land where Canada Park now sits.